The medieval presence of a High Street (formerly North Street), West Street and East Street begs the question, what happened to South Street? The answer is that there was one - it was Quay Street. Mapping evidence suggests that the name was changed in the 1870s, perhaps because Portland Street began to effectively do the same job. A rare surviving milestone, which was once a common sight around the borough. The road became part of the A32 in 1922, but it is awfully narrow, with barns built up against it rather than the houses with large gardens that other main roads had, and by the 1940s it was sharing this role with Portland Street. In the 1970s it's not clear whether it maintained this status over Eastern Way, but by 1986 it had lost it all together. The road starts where West Street meets Church Path, not at the High Street junction, owing to the geography further along. 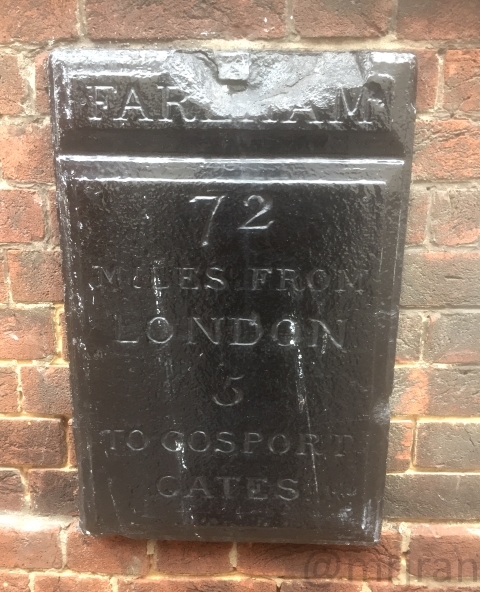 It starts outside the pub which was called The Bugle, which still has a milestone on the side of it (pictured) saying "FAREHAM: 72 miles from London, 5 miles to Gosport Gates" - a difficult decision! These were a common sight along the modern A32, and probably can still be found if you look in the right places, but this one stands out. Today the road has a single alternating line of traffic, but the restrictions on West Street mean it is almost entirely northbound only. In the '70s and '80s it was northbound only, with Portland Street running in the other direction, but in the 1940s (before Western Way was built), it was southbound only. Its purpose was mainly industrial, being home to corn merchants, warehouses and yards. The apartments at the top end replace G.A. Day's hardware shop, while the service yard on the other side replaces car parking, and before that, the back of shops. The fire station was in this area until 1910 too. 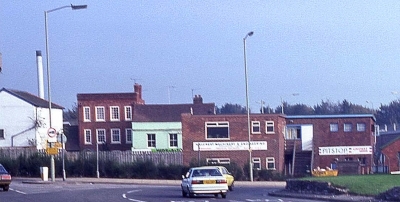 Continuing south, the police station is built on the site of Clark's Yard, a former builder's yard and engineering works which had been built of Fareham Red Bricks, and before that it was cottages. The fire station was accessed through here and a foundry was opposite. Beyond here, it was mostly cottages, some of which had been converted in to shops and businesses, and the Chequers Inn at the far end (which survived the first phase of roadworks but not the second). Opposite the Inn was the footpath to allotments and Bath Lane Park. One gap between buildings became an access to the cattle market. Old barns, attached to the cottages, were taken down in the 1970s as part of Fareham's grand plans to modernise itself. One of these was found to have a tunnel leading to the quay, which is likely to have been for smuggling. Some of these were replaced by car parking. Most of this has been lost to the construction of the associated Quay Street Roundabout and an extra foundry site that became Tesco. Some of these became one of the town's first car parks. The diversion of the road to meet the new roundabout left a small stub which was used mostly for car parking. At the end was Kingdom Hall. Before then, it would have it continued under the railway arch and met Upper Wharf - when the road was redirected, Upper Wharf claimed some of its leftovers. Upper Wharf provided access to Upper Quay (and Bath Lane), one few surviving remnants of Fareham's history as a port. It would have once been a busy site trading various commodities, and used for shipbuilding too. The mostly new buildings along here replaced a couple more small cottages. The Lafarge Aggregates building was originally Corys' Wharf filling station, serving the new roundabout which was briefly piped through the arches. Quay Street then merged with Portland Street to form Gosport Road. In its one way days, the road effectively split, giving choices of heading down to Gosport or back up to town.